It’s been a long time coming but finally, in July, the Bastow Institute opened its doors to students and teachers. However, the students are not the primary aged children for whom the original building was designed, but teachers and school administrators who are preparing themselves for a leadership role in education. The architect is Peter Maddison, who fronts the Australian TV program Grand Designs. It is a building where old meets new, with stunning results. Travelling west along Queensberry Street, you pass the old Victorian State School No. 307, which opened in 1882. The original frontage remains, with its imposing red brick Gothic structure, and a statue of the architect, Henry Bastow, stands close to the entrance to greet students and teachers as they arrive to take their seats for a day of learning. The school opened ten years after the Victorian Education Act of 1872 introduced public education for young people, instigating a rapid school building program throughout the state. Many schools were designed by architects who won their contracts through submitting prize-winning designs. North Melbourne Primary was one of several schools that were designed by Bastow himself, and his distinctive architectural style made a mark on school buildings in both metropolitan Melbourne and regional Victoria. Henry Bastow, at 33, was appointed to the Victorian Government’s State School Division Department as architect and surveyor in 1873, the year after the 1872 Education Act introduced compulsory, free and secular education for all children between seven and 15, regardless of their circumstances. He had the challenging job of designing and building hundreds of schools throughout the state, catering for a huge variation of locations, available building materials and local educational requirements. Designs ranged from one-teacher schools to large inner-city establishments. In the ﬁve years following his appointment, 615 schools were built and opened. And Bastow’s personal stamp was unmistakeable, with picturesque, nee-Gothic embellishments such as bell towers and spires, gabled roofs and traceried windows. The Queensbeny Street building is a two-storey red brick with limestone quatrefoil tracery, rendered trims and a bluestone plinth. Its main features, inﬂuenced by the British Gothic revivalist architect William Butterﬁeld (1814-1900), are the central tower and the ﬁve traceried windows on its upper ﬂoor. It is unclear why and when the primary school ceased to operate. A new printing school was built at the back of the property in the 1950s but this ﬁnally closed its doors in the 1990s. Both buildings were allowed to deteriorate to the extent that a major redevelopment of the site was necessary, and the printing school was demolished in 2009. The building had been occupied by vagrants and pigeons for ﬁfteen years before, in 2008, the premier John Brumby announced that it would be resurrected to house the Bastow Institute. The building had been allowed to disintegrate to almost a point of no return, and the builders faced many unforeseen problems — beginning with having to dispose of 30 tons of pigeon poo that had hardened over the years, contaminated and unstable soil and lead paint contamination, and then ﬁnding that the painted surface of limestone blocks was holding the blocks together. When the paint was removed the blocks crumbled away. Once the building was substantially ﬁnished, the poor water pressure in the area meant that it could not be given a ﬁre safety clearance, and this took several months to rectify. While the old 1882 building has been restored as closely to the original as possible, there is a modern state-of-the-art extension that incorporates the highest standards of design of both space and technology. This houses a below ground theatrette to seat 100 people, with all the latest technological gadgetry to allow for interaction between speaker and audience. State-of-the—art technology also allows direct broadcast to schools A particularly important for small rural schools where it is difﬁcult for a teacher to attend a course in the city. A three-storey glass lift links the theatrette with the ground and upper ﬂoors where there will be “break-out” rooms, a demonstration. classroom and lounge/staff areas. The old building has been renovated to its original design and with, as far as possible, the same materials. The new additions are in stark contrast to modern extensions. While the old chimney stacks remain, the ﬁreplaces themselves will be covered over as they are draughty — there is nothing left as a template for their renovation, and present day heating methods make them redundant. Peter Maddison’s interior design and decoration makes a bold, distinctive statement. He explained that the variation in angles he has used - there is not a single 90-degree angle within the interior of the new building - is a metaphor to challenge traditional thinking. His use of primary colours is similarly bold and symbolic, with a recurring ﬂying geese motif, which, in the simple right-angled version, also represents an open book. He has also been able to maximise the amount of natural light. His stated aim was to provide an exemplar of what government education can provide. The Dewey Common, an area that can be partitioned off from the main building, is available for use by community groups. Much has changed since Henry Bastow died in 1920. I suspect that he would be impressed at how the old and the new have melded together to create a very functional and state-of-the-art building. 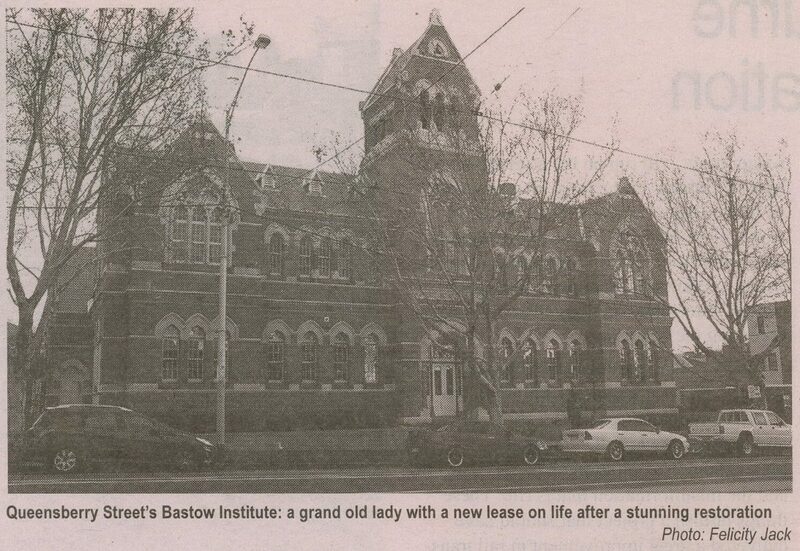 The Bastow Institute has lofty intentions, in parallel with the building that has provided it with a magniﬁcent home. Let us hope that this inspired building will have a positive beneﬁt for all the students of Victoria, not only for the administrators who will sit in it. by Felicity Jack - member of the Hotham History Project, an author and lives in North Melbourne, September 2012. You are invited to join the Hotham History Project. You will receive notice of meetings and activities, which have included history walks, informative talks and information sessions at the North Melbourne Library, showing of old films, an historical enactment and the laying of a plaque to commemorate the 150th anniversary of the first building in North Melbourne. The Hotham History Project is an incorporated body run by the community.